Come and visit our Clitheroe and Skipton stores this weekend for some fantastic offers across all our departments in store. At our Clitheroe store we also have Maxwell's cafe bar where you can enjoy breakfast, lunch, coffee and cakes. 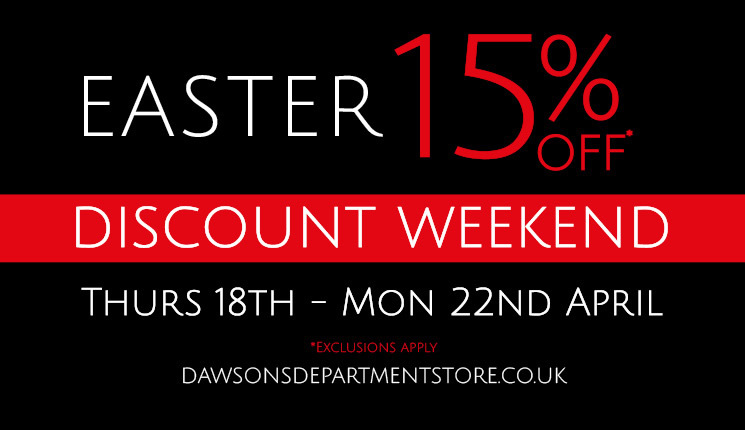 So come and make a day of it, this Easter weekend at Dawsons. Our stores display a selection of the products that we have listed online along with many more brands and product lines. Independent specialist retail websites listing a large range of brands from specific product ranges, available to deliver to home - many on a next working day basis. Dawsons Department Store is a family owned business which originally started in the centre of the market town of Clitheroe in the Ribble Valley, Lancashire. Originally opened as an ironmongers and fireplace merchant serving the rural farmers, we have expanded into the leading independent houseware store in the area. Our departments now include Cookshop, Bedlinen, Hardware & Paint, Giftware, Barbecues, Garden Furniture, Handbags, and Luggage. In 2004 we started trading online, and we now have the leading websites selling cookware, tableware, barbecues, garden furniture, and bedlinen. In 2014 we opened a new store in the historic town of Skipton in North Yorkshire, selling cookware, tableware, barbecues, garden furniture and bedlinen.